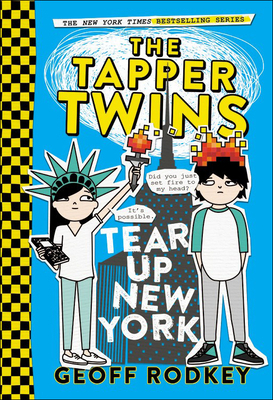 In the follow up to the "New York Times" bestseller "The Tapper Twins Go to War, "the twins' school scavenger hunt turns into a "madcap, uproarious romp around the Big Apple" full of "action, hilarity, and mayhem" ("School Library Journal"). Geoff Rodkey delivers another pitch-perfect ultra-modern comedy told as oral history with texts, screenshots and smartphone photos. When Claudia initiates a citywide scavenger hunt to raise money for charity, it's not just the twins' opposing teams that run riot. With the whole school racing to trade in sights seen for points to score front row tickets at Madison Square Garden, they may not get to the finish line with their dignity-and social lives-intact. Geoff Rodkey is an Emmy-nominated screenwriter who has written the hit films "Daddy Day Care," "RV," "The Shaggy Dog," and the Disney Channel original TV movie "Good Luck Charlie, It's Christmas." He is also the author of "The Tapper Twins Go to War (With Each Other)," and "The Tapper Twins Tear Up New York, "as well as the middle grade trilogy The Chronicles of Egg. He lives in New York City.